The sensorial materials help children to distinguish, to categorize, and to relate new information to what they already know. This process is believed to be the beginning of conscious knowledge. It is brought about by the intelligence working in a concentrated way on the impressions given by the senses. If children have access to mathematical equipment in their early years, they can easily and joyfully assimilate many facts and skills of arithmetic. Facts and skills that may require long hours of drudgery and drill if they are introduced to them later in the abstract (pencil and paper) form. Children in a Montessori class never sit down to memorize addition and subtraction facts; they never simply memorize multiplication tables. Rather, they learn these facts by actually performing the operations with concrete materials. They work the problems with appropriate materials and they record their results. Children learn the phonetic sounds of the letters before they can learn the alphabetical names in a sequence. The phonetic sounds are given first because these are the sounds they hear in words that they need to be able to read. The children first become aware of these phonetic sounds when the teacher introduces the consonants with the Sandpaper Letters. The individual presentation of language materials in a Montessori classroom allows the teacher to take advantage of each child’s greatest periods of interest. The children’s interest in reading is never stifled by monotony but cultivated as their most important key to future learning. They are encouraged to explore books for answers to their questions, whether they are about the planets, bicycles or plants. The children are introduced to grammar by games that show them that nouns are the names of things, adjectives describe nouns, and verbs are action words. The large wood puzzle maps are among the most popular activities in the classroom. At first, the children use the maps simply as puzzles. Gradually, they learn the names of many of the countries as well as information about climate and products. The maps illustrate many geographical facts. Children also learn the common land formations such as islands and peninsulas by making them. 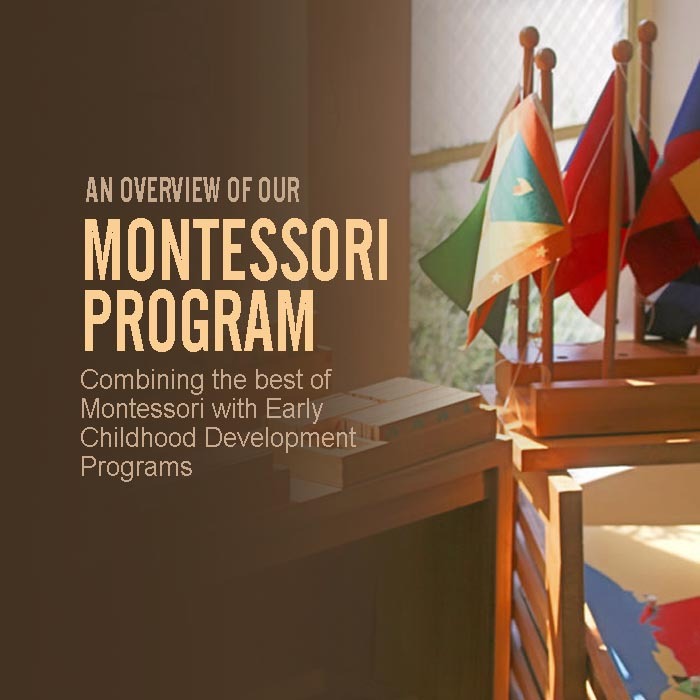 Montessori offers the children a concrete presentation of history by letting them work with a Time Line, long strips of paper, which can be unrolled and stretched along the floor of the classroom. The line is marked off in segments, representing consecutive periods of history. The children begin by making a time line of their own lives, starting with their baby pictures. The children gain an awareness of the world around them by exploring other countries, their customs, food, music, climate, language and animals. This helps to raise their consciousness about other people, to gain an understanding, tolerance and a compassion for all the people in the world. The children study the four basic food groups and learn what their bodies need in order to be healthy. They cook nutritious foods that revolve around their studies of other countries. Art in the primary environment strives to maintain the great joy the child finds in creating something of his or her own. The children have the freedom to explore their imaginations in a variety of mediums used for expression. The importance of the process is stressed at this time, not the end product. Music is fundamental in the classroom. All types of music are integrated. Music appreciation is cultivated, and music used by the civilizations throughout history is unfolded before the child. Music will find its way in all aspects of the classroom - as a subtle background during work time, to signal cleanup time, as an integral part of the cultural curriculum, as a form of celebration and fun. It’s beautiful to watch a child identify and request Mozart or John Philip Sousa as he or she walks on the line! In science the children’s natural curiosity is stimulated through discovery projects and experiments, helping children draw their own conclusions. The plant and animal kingdoms are studied in an orderly fashion to foster a love and appreciation for all living things. What an adult considers ordinary, like washing dishes, polishing shoes, a child finds it fascinating. They are exciting to children because they allow them to imitate adults. Imitation is one of the strongest urges during a child’s early years. Children also learn good working habits like putting away all materials before beginning another activity.